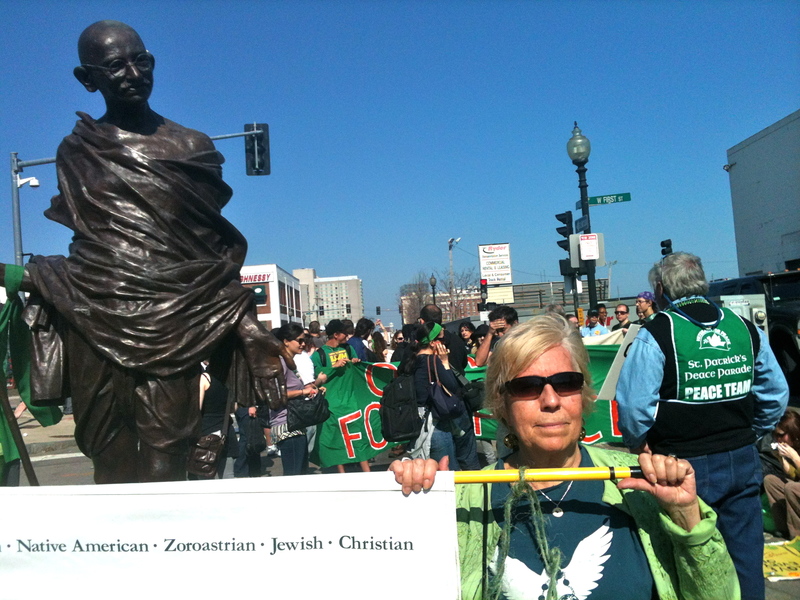 Why should peace be excluded from St Patrick’s Day? 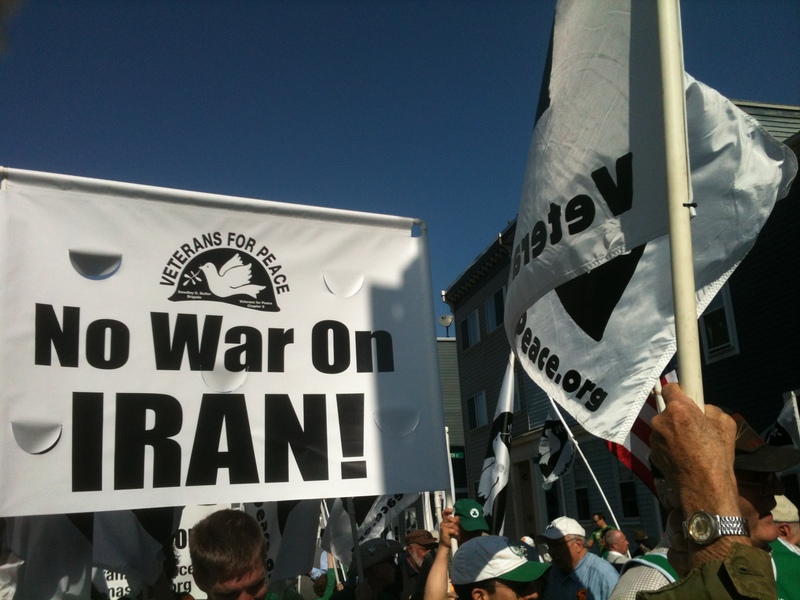 Using “Veterans” and “Peace” together makes sense: who better than a soldier knows the horrors of war. 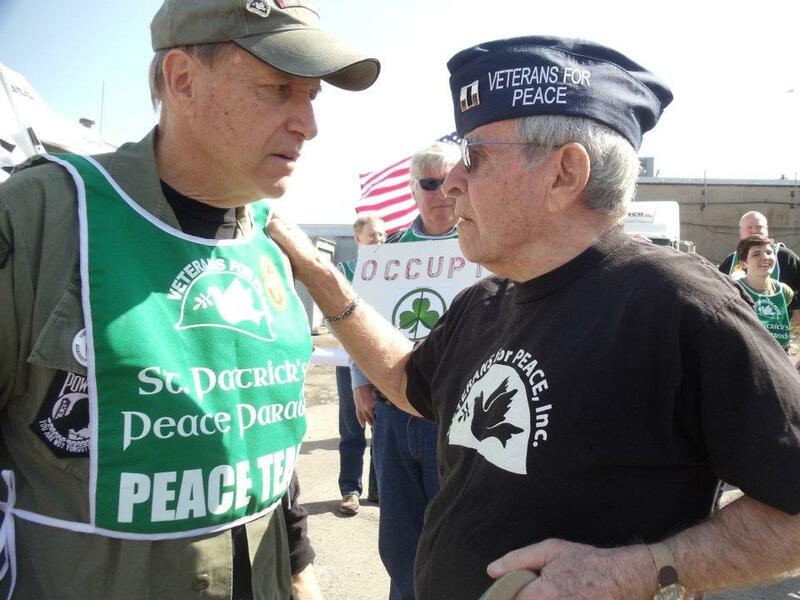 Veterans For Peace has over 120 chapters across the USA. This is a slightly modified version of my article published in the Global Post commentary section on March 20, 2012. Link to my photos. 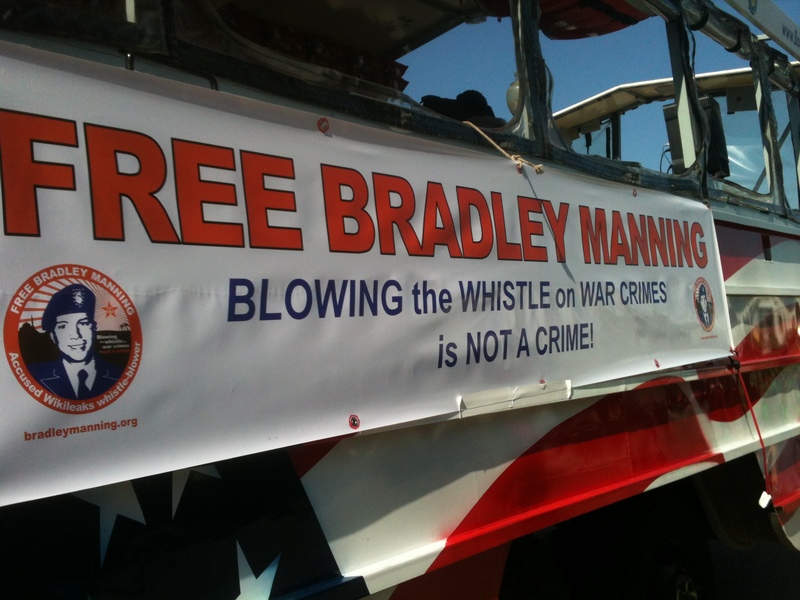 Free Bradley Manning: Blowing the whistle on war crimes is NOT a crime – sign on a Duck Boat at the Peace Parade. We don’t have St. Patrick’s Day parades in Pakistan, but we do have discrimination. And as elsewhere, our media often sidelines the struggles for justice and against discrimination. 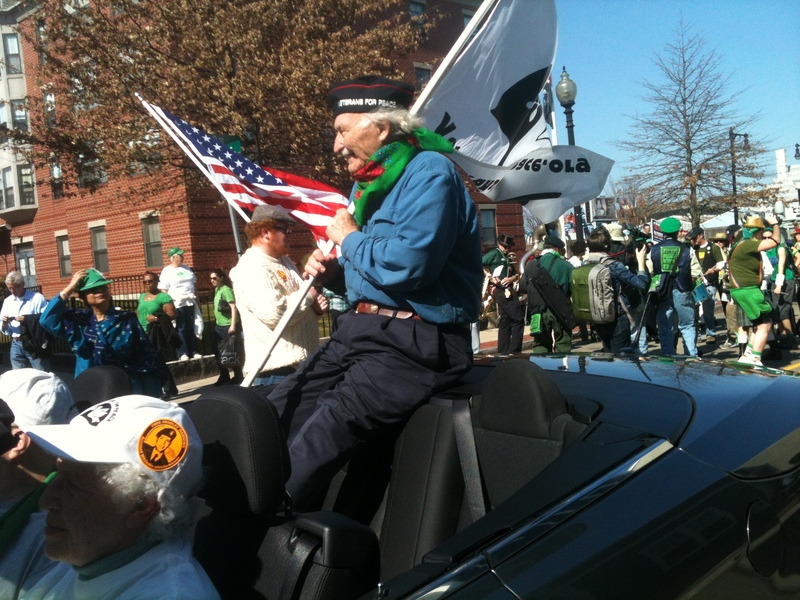 So it sounded familiar when I heard that the Allied War Veterans’ Council (AWVC) had refused, for the second year running, to allow the Veterans for Peace (VFP) to participate in the ‘official’ St. Patrick’s Day parade in South Boston. It was at an event titled ‘Bridging the Divide: USA/Pakistan’ where I was speaking on Saturday, sponsored by seven organizations, that moderator Cole Harrison of Massachusetts Peace Action made the announcement. 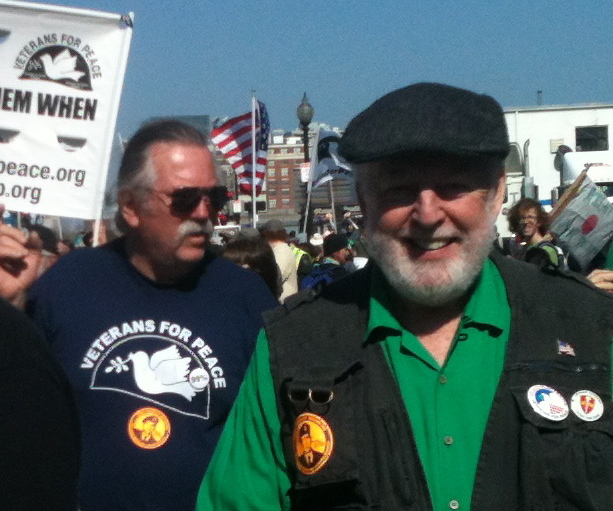 VFP, he said, would hold its second St Patrick’s Day Peace Parade the next day, Sunday. As I started looking into it, it became clear that the alternate parade was not just about discrimination. It was also an effort to get the peace message into the public domain. Parade organisers, decorated war veterans Pat Scanlon (on left) and Tony Flaherty discuss details before the Peace Parade is allowed to march. Thirteen VFP members marched, with permission from the Boston Police, at the end of the St. Patrick’s Day Parade in 2003. They were protesting the imminent attack on Iraq, which took place two days later. The AWVC sued the Boston Police Department and got a court order stating that any future marches would have to be a mile behind the regular parade. So the VFP and LGBT groups held their own parade again, joined by more organizations from around the country, including the Occupy people. The estimated 1,500 to 2,000 participants were at least three times more than last year’s 500. The numbers are likely to grow every year as word gets out. Legally VFP may not have a leg to stand on, but morally they’re spot on. The Boston community overwhelmingly supports them – including the 60 organizations that form the South Boston Association of Non-Profits. So does the public. 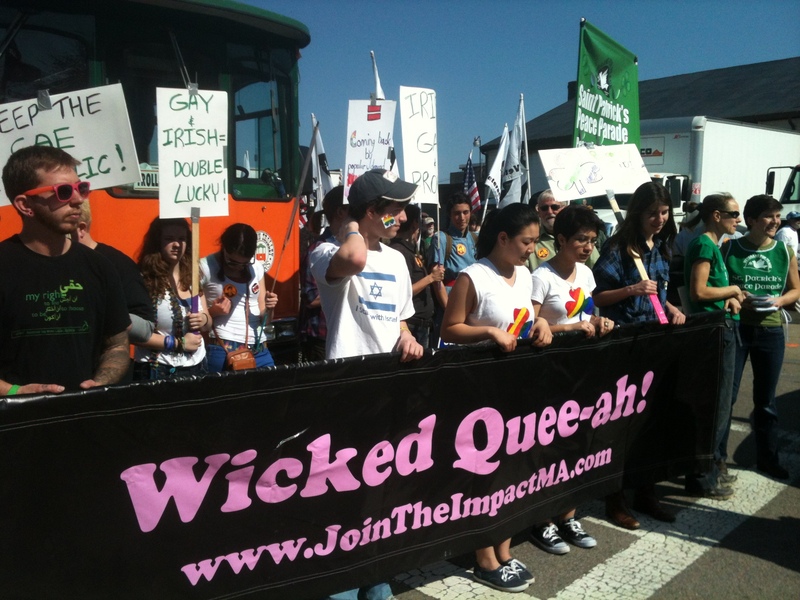 Everyone I spoke to on the sidelines of the St Pat’s Day Parade in South Boston said that excluding them was discriminatory and wrong – some had been unaware of it. The police would undoubtedly be happier dealing with one parade rather than two. They even informally offered to get VFP into the main parade but “we said we will only walk with the official parade if our LGBT brothers and sisters are also allowed,” said Pat Scanlon of VFP, who organised the Peace Parade.